Visit the Veggie Valet booth (located on Wall Avenue near the Market Square stage) between 9am-2pm to pick up giveaways, including: cooler bags, recipe cards, measuring spoons, and temporary tattoos! You’ll also have the opportunity to enter a raffle for a chance to win MSFM swag and gift certificate! Stop by the Market Square Farmers’ Market for a temporary “I heart Farmers Market” tattoo, or order online! Just take a photo featuring the tattoo and post the photo to Instagram with the hashtag #LoveMyMarket by August 31. Check out the Farmers Market Coalition for details. Just take a photo of your haul from the Market Square Farmers’ Market, post on Instagram using the hashtag #myMSFMhaul, and tag @marketsquarefarmersmarket by August 12! Post a photo of your purchases from the MSFM. Get creative! Use the hashtag #myMSFMhaul and tag @marketsquarefarmersmarket. Post by August 12 (but photo can be from previous haul). You can post as many hauls as you’d like! Each haul = a new entry and chance to win! And, follow along for chances to win random prizes through the week! 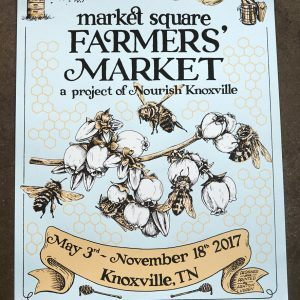 For events held at farmers’ markets across East Tennessee, check our our Event Calendar!